1. Combine the sake, mirin, dark soy sauce and sugar in a small saucepan. Bring the mixture to the boil over medium heat and boil, stirring until all the sugar has dissolved, then add the ginger and garlic and remove the saucepan from the heat. Leave the mixture to cool for 30 minutes. 2. To prepare the octopus, use a small knife to carefully cut between the head and tentacles of the octopus, just below the eyes. Push the beak out and up through the tentacles with your finger, then remove the eyes from the head of the octopus by cutting off a small disc and discarding it. To clean the octopus tube, carefully slit through one side, avoiding the ink sac, and scrape out any gut. Rinse the inside under running water to remove any remaining gut and cut it in half. Wash the rest of the octopus thoroughly under running water, pulling the skin away from the tube and tentacles. If the octopus are large, cut the tentacles into quarters. 3. Put the octopus in a large, nonmetallic bowl. 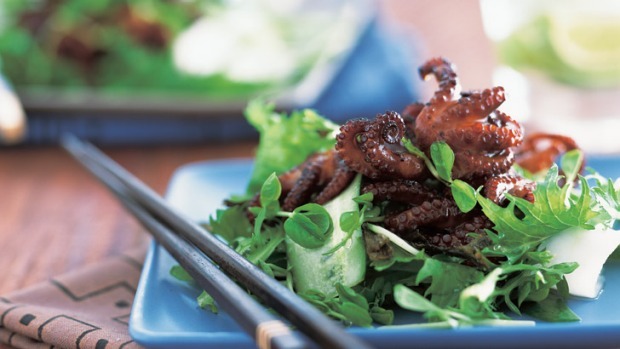 Whisk the teriyaki marinade, making sure that it is well combined, then pour it over the octopus, stirring so that the octopus is thoroughly coated. Cover and marinate it in the refrigerator for at least 2 hours, or overnight.